Asbestos is actually a natural component of the environment of the New York City region, and has been for over 450 million years! At two locations within New York City itself the underlying rock contains chrysotile: a large occurrence lies beneath northern Staten Island, and one underneath CUNY's John Jay College of Criminal Justice in midtown Manhattan. There is a third on the New Jersey shore of the Hudson River in Hoboken, and a fourth in Westchester County at New Rochelle. In 1858, the H.W. Johns Manufacturing Company began mining chrysotile from the serpentinite body on Staten Island for the local manufacture of fire-resistant shingles. The H.W. Johns Manufacturing Company merged with the Manville Covering Company. The new company, Johns-Manville became a world leader in asbestos mining and asbestos-related manufacturing. But remember, it all started on Staten Island. 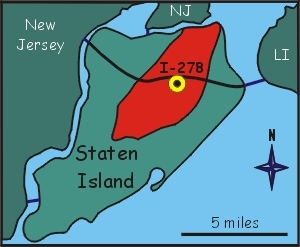 A lens shaped body of serpentinite underlies a 55 km2 area of north central Staten Island. It is well exposed along a prominent ridge that reaches an elevation of 135 meters above sea level, the highest elevation of any natural feature in NYC. 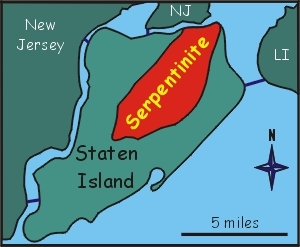 The Staten Island serpentinite is composed of 97% serpentine group minerals. As average sample would contain 66% lizardite (a non-asbestos form of serpentine) and 27% chrysotile. Traces of an amphibole asbestos called anthophyllite is also present. Although the rock is almost completely replaced by serpentine, the original igneous texture can still be seen in the rock. The leopard-like mottling of the rock mimics the shapes of the original minerals that the serpentine replaced. 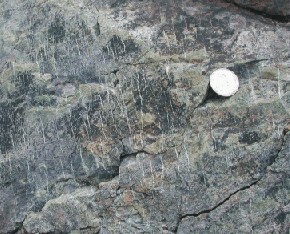 Note that the serpentinite does not generally contain large veins, so the chrysotile fibers that are present tend to be very small. That is a quarter for scale. 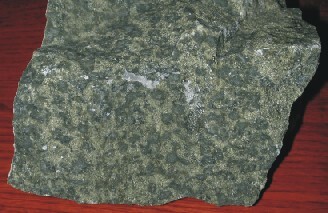 Studies of the serpentinite that is exposed across a large road-cut on I-278 indicates that the rock is composed of over 50% chrysotile. 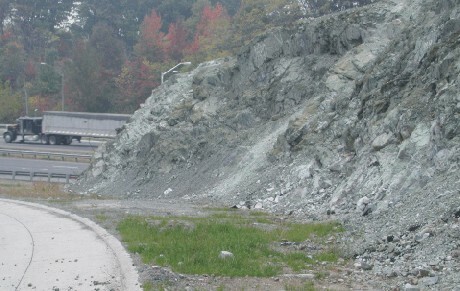 The fact that Staten Island's serpentinite body occurs as a topographically high feature means that mechanical erosion can occur rapidly along exposed surfaces like road-cuts, continually freeing asbestos fibers into the air. 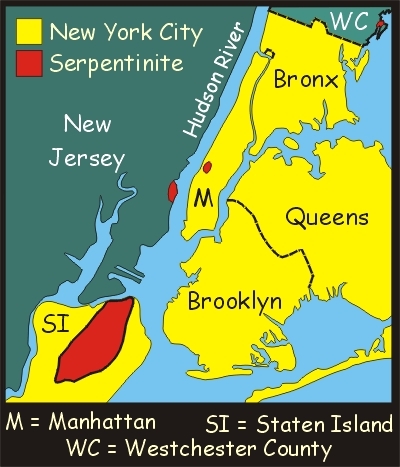 The serpentinites of New York City were originally peridotites before they were altered by reaction with hot water near the Earth's surface. These peridotites formed in the mantle below the seafloor off the coast of ancient North America (officially known as Laurentia) approximately 500 million years ago. 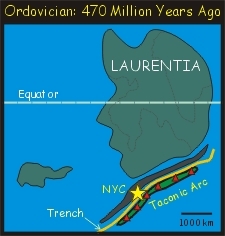 Ocean offshore of Laurentia was being subducted below a long volcanic island chain (called the Taconic Arc) which was moving toward the continent. 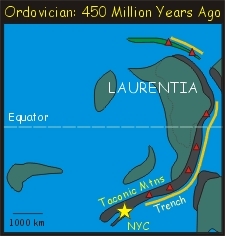 Approximately 470 million years ago, the Taconic Arc began to collide with the margin of Laurentia and in the process, pushed a slice of intervening ocean floor onto the continent in a process called obduction. Pieces of the bottom of this obducted slice of oceanic rock became the serpentinites of New York City. 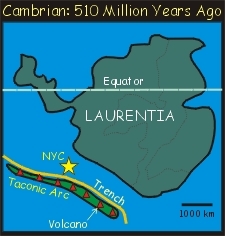 Over the past 450 million years, continued erosion has worn away the Taconic Mountains (part of the Appalachians) to the relatively flat landscape we now see in New York City. Most of the obducted ocean has been eroded away, but we still have scattered remnants, such as the Staten Island serpentinite.